Due to computer issues and a need for relaxation around the holidays, I have sadly neglected this blog. I do have a lot of pictures and things to share that I’ve been saving up, though, so I hope to have more regular posts in the future. First up: some friends and I have organized a homeschool 4-H club. I was in 4-H as a kid and dearly loved it (some of my childhood projects included: karate, gardening, cooking, cross-stitch, dogs, hamsters, and cats). I wanted my kids to have fun 4-H experiences, too. 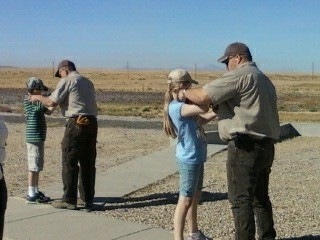 One of the first things we did in the 2010-2011 4-H year was shooting at the Lee Kay shooting range. 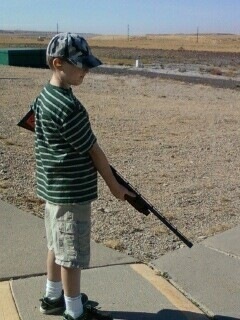 We began in October and the first day we did shotguns. I was surprised they started with this…the guns were quite heavy and some of the smallest kids (Nia included) needed help even holding them up. 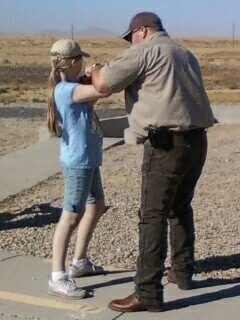 The kids also had some trouble holding the guns tightly enough to avoid bruising on the kick-back after the shot was fired. But the wonderful people at Lee Kay were GREAT with the kids, and so patient and helpful. 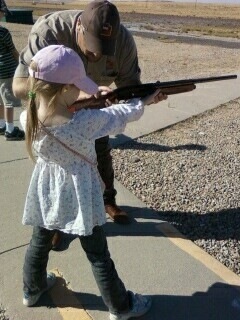 The kids had a great time shooting clay targets. 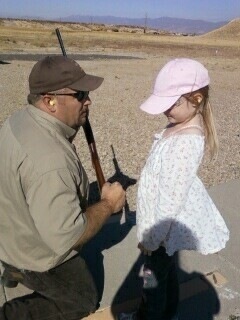 Even though shotgun shooting wasn’t their favorite kind of shooting, it was a good experience…I can’t say enough positive things about the great staff at Lee Kay and how wonderful they were with the kids. I’ve been really sick the last 3 weeks with some kind of cold or respiratory gunk, so it’s been quite a while since I’ve felt up to doing stuff online. But three weeks ago tomorrow the kids and I went to the Utah Renaissance Festival and Fantasy Faire. It was so much fun, even though I was a day into a horrible cold. Last year the kids and I didn’t have costumes but this year we wanted some. Time was short, so we modified what we had, shopped thrift stores, and made it work. Nia used clothes and fairy wings she already had. I found a long thrift-store skirt for myself and we modified an old vest. My mom made me a poufy shirt and apron. For the older kids, including their nephew Benjamin, we made hooded cloaks. Friday morning before we left I made some drawstring bags to get around the problem of needing a place for money, keys, camera, and phone but still look authentic. I’d crossed my fingers every day for two weeks on checking the weather and it was supposed to be mostly sunny and 66 degrees. Perfect! Unfortunately, in the afternoon a big rainstorm hit and it was pretty cold and wet for a while. We kept warm by huddling around the blacksmith’s fire. There were all manner of colorful characters wandering around…our favorite was Captain Jack Sparrow himself. He had the look, the costume, the mannerisms, the walk, the lingo, the ship, and even the voice. A highlight of the faire is always the jousting with the hilarious Knights of Mayhem. One of our favorite parts of the Faire is all the awesome shops and booths where you can buy authentic costumes, weapons, treats, and accessories. We let each child take $20 this year and they had so much fun spending it. Nia got a parasol, a gorgeous inlaid box made of stone, and a necklace with a real flower imbedded in it. Bran bought himself a boken—a wooden samurai-type sword and also a leather baldric to hold his wooden sword he bought last year. Ciara bought a sword and baldric combo and a crystal. I got a messenger-type bag and a handmade white wide-brimmed hat, which the makers stretched for me to get the perfect size. Besides the jousting and shopping we watched a magic show, a massive jenga-type game, and a shop owner demonstrating “Contact juggling” like Jareth in the Labyrinth movie. It was so much fun and as we drove away, exhausted, hungry, and footsore, we were already talking excitedly about next year’s Faire.